This page explains the ideas behind the idenity platform IRMA. It also explains how the system works and has been designed. The following topics will be discussed. What is IRMA all about? Why would you wish to use attributes instead of identities? How do I obtain and use attributes? What if I renew or loose my phone? How does IRMA differ from other authentication systems? How does IRMA work under the hood? Which privacy guarantees does IRMA provide, and which not? Which values does the IRMA technology embody? These questions will be addressed one by one below. Elsewhere there are shorter explanations, for IRMA app users and for IRMA verifiers. 1. What is IRMA all about? In many countries, when you buy a bottle of whiskey, you are obliged to prove that you are older than 18. You don’t have to prove who you are. Just this personal property, that you are over 18, suffices for the whiskey purchase. Such personal properties will be called attributes. IRMA is the name for a system that allows you to do precisely this. IRMA stands for I Reveal My Attributes. IRMA empowers you to disclose online, via your mobile phone, certain attributes of yourself (“over 18”), but at the same time hide other attributes (like your name, or phone number). IRMA protects your privacy in this way. This privacy-protection is intrinsic to the system, which is called privacy by design. In the most recent European data protection regulation such privacy by design is legally required for new ICT-systems. Apart from instrinsic privacy-protection, IRMA also protects against identity fraud: if your name and date of birth are not revealed at all, they cannot be abused. The list below gives several examples of attributes that may be useful, for instance for interaction with a webshop, with the government, with your bank, or at a webforum, etc. Some of these attributes are uniquely identifying, like your bank account number: it is associated with a single person. But some other attributes can be used anonymously, without disclosing who is involved. These non-identifying attributes apply to multiple people. Attributes form a natural mechanism for revealing certain aspects of yourself, while at the same time selectively disclosing other aspects. There are many scenarios where attributes provide precisely the relevant information that is required for a certain transaction. If you wish to join an online chat-box for minors, you have to prove that you are younger than 15, for instance. Or if you want to participate in an online discussion group of people with a certain sensitive disease, this disease itself can be the attribute that gives you anonymous access to the group. When you wish to buy a violent game/movie/book online, you have to prove that you are older than 16, or may even older than 18. If you possess the “student” attribute you may be able to get a discount at a hairdresser; en if you have the “handicapped” attribute of specific kind, you may be entitled to special transportation. For a purchase online you home address attribute is needed for delivery. Discounts may be available via a loyalty attribute of the webshop. And possible an age limit attribute is required if the item that you purchase is not intended for minors. In short, IRMA is about attribute-based authentication: it is not about who you are, but what you are. This is very natural and intuitive. When you visit a doctor in a hospital you may wish to know his/her name for communication, but a much more important attribute is that the relevant person is a qualified medical doctor indeed. In the non-digital world we rely very much on context: the person wears a white coat and receives you in an office in a building that says “hospital” above it entrance. But in the online world such context information is often missing (or is easy to fabricate), so that we have to use attributes like in IRMA for trusted intraction. 2. Why would you wish to use attributes instead of identities? The short answer is: attributes protect you and empower you. Via a unique personal number, like a passport number or a national registration number, people can be recognised in many different situations and all their actions can be linked. This has many advantages, for instance in public services. But it can also have serious disadvantages, especially when this unique personal number is abused by someone else. This is called identity fraud, and it is one of the biggest plagues of the digital era. When you use anonymous attributes, instead of a unique personal number, for a transaction, then your identity does not play a role and cannot be stolen. In this sense, attributes protect you. Usage of attributes, instead of identities, has additional advantages. It is privacy-friendly because of data minimalisation. Only those attributes which are relevant and necessary for a transaction need to be disclosed. It provides the user, at least with IRMA, real control and transparancy about who is requesting to see which attributes. It is flexible and can be used in many situations. It prevents linking of different transactions, as long as non-identifying attributes are being used. Hence it also prevents open or surreptitious surrveillance and profiling, and everything that is associated with it, such as price-discrimination (the price that you have to pay depends on the profile that has been assembled about you). In many digitisation projects of the past decades attributes from daily life have been replaced by digital identities. An example is smart card based e-ticketing in public transport. Traditionally, having a (anonymous, untraceable) paper ticket was enough to get on a bus or train. These days one implicitly reveals one’s identity by using a (uniquely numbered) smart card. Via such cards individual movements can be traced and stored for many years, be used for marketing purposes, and posssibly become public through a computer hack or through negligence. Anonymous cards, at least in the Netherlands, do not offer much privacy protection, since when an error needs to be corrected or when you want to receive any remaining saldo on the card after its expiration, you need to disclose your identity. In this way a connection is made between you and and all your travels, which, you thought, were anonymous. Attribute-based identity management (re)introduces more protection and flexibility for users. Additionally, attributes offer some protection for service providers against possible disadvantages of total anonymity, because they can demand that participants do reveal some minimal level of relevant data about themselves, for instance that they are female, or under 12, in special online discussion groups for women or for children. 3. How do I obtain and use attributes? In the IRMA identity platform your personal attributes are securely stored in the IRMA app on your own phone (or tablet) — and nowhere else. The app is protected via your own PIN code. This personal PIN ensures that no-one else can use your attributes in your IRMA app, and thus steal your identity. Of course, it is important that, in addition, your phone has its own login pattern or code. But on top of that, the IRMA app has its own PIN, just like various apps from mobile banking have their own PIN. national or local (government) authorities, for attributes like: name, address, date of birth, national citizen numbers, categories of income, etc. banks and insurance companies, for attributes like: bank and/or insurance account numbers, type of insurance, etc. big or small webshops, with loyaly cards and custum numbers, with associated status, coupons, etc. IRMA attributes are available from many sources – but not from all of the ones listed above. The Privacy by Design foundation keeps a public register of all available IRMA credentials (sets of attributes). If you wish to obtain certain attributes from such an issuer you first have to authenticate (prove who you are) to this issuer. Subsequently, this issuer can look up in its own database which attributes it knows about you, and you can choose from the available attributes which ones to download to your IRMA app on your phone, digitally signed by the issuer. Concretely, in order to obtain attributes from your bank, you have to log into your bank first. This is precisely what happens with iDIN. Once your IRMA app contains a collection of attributes, you can start using them in various transactions. In such transactions the other side (think of a webshop) may ask you, for instance, what your home address (attribute) is. After you have explicitly agreed to such a request, and typed in your PIN code, this attribute is revealed by the IRMA app to the webshop. By performing some cryptographic checks, the webshop can verify that the attribute is genuine, has not expired, has not been manipulated, has been issued by a specific issuer, and also that it really belongs to you (actually: to your phone). This requesting party, who wants to see some of your attributes, is called a verifier, or sometimes a relying party. There is a special verifier page explaining what this role amounts to. It is built into the IRMA system that these verifiers must make very clear to you which attributes they request to see. You, as an IRMA user, have to explicitly agree to the release of those attributes. In this way it is clear and transparant who wants to know what about you. The IRMA app keeps its own log, so that you can see later which verifier has requested which attributes (at what time), and what you have revealed. If there are verifiers who request disproportionally much information from users, you can file a complaint, based on these logs, for instance with your (national) data protection authority. Attributes in IRMA carry a digital signature of the issuer. Via this signature the verifier can check the origin and the integrity of attributes. Attributes have an expiry date, which can also be checked by the verifier. If attributes have expired, they need to be refreshed by the user, by returning to the original issuer. This works just like for passports, identity cards, or driver’s licenses: at some stage they expire, and you need to get it re-issued. Refreshing of IRMA attributes is much simpler, however, since it can be done online. The three pictures below give a schematic overview, first of downloading attributes at an issuer, and subsequently, of using attributes at two different webshops. This downloading of attributes is a natural form of modern identity management. It allows you to assemble and maintain your own personal digital passport in your IRMA app. Such personal data management is a bit like installing and removing apps on your phone or tablet. 4. What if I renew or loose my phone? Your IRMA attributes are stored only on your own phone and nowhere else. This is a deliberate design choice of the IRMA platform, as part of privacy by design. The disadvantage is that with a renewal (or loss) of your phone, in principle, you have to reload all attributes into your new phone. This is comparable to an ordinary passport: when you lose it, a new one is needed. In case of theft or loss of your phone your attributes are protected against misuse by the thief or finder by your IRMA PIN. Since this PIN has to be entered each time when you disclose or receive attributes, the thief or finder of your phone will be unable to do anything with your attributes. However, it is still wise to immediately block your IRMA app via the MyIRMA portal. The Privacy by Design foundation is working on backup functionality for attributes. It allows you to restore these attributes from this back-up into your new phone. The attributes in the old phone are then disabled. This back-up functionality will be added to the IRMA app in due course, via the regular update mechanism. 5. How does IRMA differ from other authentication systems? In this manner IRMA offers optimal privacy protection, by design. To compare: if website X does not use IRMA for user authentication, but let’s say Facebook login, you are re-directed to Facebook when you wish to login at X. After logging into Facebook, using your Facebook credentials, Facebook gives website X certain information about you. In this way Facebook learns where you login at what moment and uses this information to extend your profile and adapt its advertisement targeting. In addition, it is not transparant to you which data about you website X receives from Facebook. Many identity management systems are organised in such a centralised manner. This is commercially most interesting for the providers of the identity management system: they can not only build up and sell profiles of all users — who logs in where and when with which data — but they can also charge the relying party for each authentication action, precisely because they are in the middle, and all communication goes through their systems. Another clear example is the iDIN authentication system that banks in the Netherlands have set up. When you authenticate via iDIN, your bank can see whether you login to a liquor store or to a psychiatric clinic. The banks promise that they will not use this information for other purposes, for instance, when they decide whether or not you will get a mortgage. In IRMA’s decentralised architecture such uncomfortable issues do not arise at all. In addition, relying parties, such as webshops, need to pay the banks per iDIN authentication session. The prices are a real concern for them, and have already led to complaints. Again, with IRMA there are no such artificial costs imposed by the chosen (centralised) architecture. The difference between a decentralised (IRMA) and centralised (non-IRMA) set-up is sketched below. It may be clear that in the non-IRMA set-up the issuer of attributes is a privacy hotspot who facilitates and sees all transactions. Moreover, in the centralised architecture a (malicious) issuer can completely take over your identity and impersonate you. You have no way to stop this, or even notice it — until possibly later when you are confronted with the consequences. In the decentralised IRMA set-up you have genuine control over the usage of your own attributes: you directly disclose your own attributes yourself, every time only after explicit consent, without (unnecessary) interference of third parties. This is similar to the way you can disclose your (physical) passport yourself, without dependence on others. In the IRMA system there are no such privacy hotspots. At a meta-level, IRMA does involve some level of coordination about how attributes and credentials are organised and which cryptographic (public) keys are needed at which stage. This coordinating role is fulfilled by the Privacy by Design foundation. But: the foundation can not see at all which attributes are used where. The Privacy by Design foundation does not monopolise IRMA and its technology. The software is open source and is freely available, for everyone to use. Also other parties can play the coordinating and/or issuing roles that the foundation is playing at this stage. In fact, it would be better if iDIN or the BIG register would directly issue IRMA attributes themselves, instead of the foundation doing so indirectly — currently, hopefully temporarily. A subtle point is wheter IRMA outperforms centralised architectures since such architectures intrinsically have a single-point-of-failure; if it goes down all authentication is disabled. In fact, IRMA also involves a small central keyshare component, as will be explained in more detail next, so that users can inspect and disable their usage, if needed. This central component plays a role in each attribute disclosure and issuance. Hence it is a single-point-of-failure too. 6. How does IRMA work under the hood? This section overlaps to some extent with the explanations for getting started with IRMA, especially its last part about registration. Technical details of IRMA will be given below, explaining why IRMA works in a privacy-friendly and secure manner. IRMA is based on non-trivial cryptography for attribute-based credentials. These credentials are containers for attributes, equipped with an expiry date and a digital signature, produced by the issuer. The underlying cryptography is based on Idemix, which has been developed since the late nineties at IBM Zürich. The technology is open and has been published in the scientific literature. This contributes to confidence. IBM has made its only implementation of Idemix publicly available, free of charge. The Privacy by Design foundation has developed its own, different, independent, open source IRMA implementation. The rights on this IRMA implementation are jointly in the hands of the foundation and Radboud University — where the initial parts of the implementation were developed. As mentioned, individual IRMA attributes are combined in a credential. For instance, you can have a credential containing the following attributes. Such a credential may for instance be issued by the (local or national) authorities. You, as user, can decide, per transaction, to disclose any subset of these attributes. In the above example, you can for instance disclose your nationality, without revealing where or when you were born. This is selective disclosure property is the basis of IRMA’s privacy by design. The party that offers such credentials according to the IRMA protocols is called an issuer. During the issuing process, the issuer puts a so called blind digital signature on the credential. This has two important consequences. By checking this signature, verifiers can check the origin and integrity of the credential. The latter means that they can check that no-one has tampered with the (contents of the) credential. 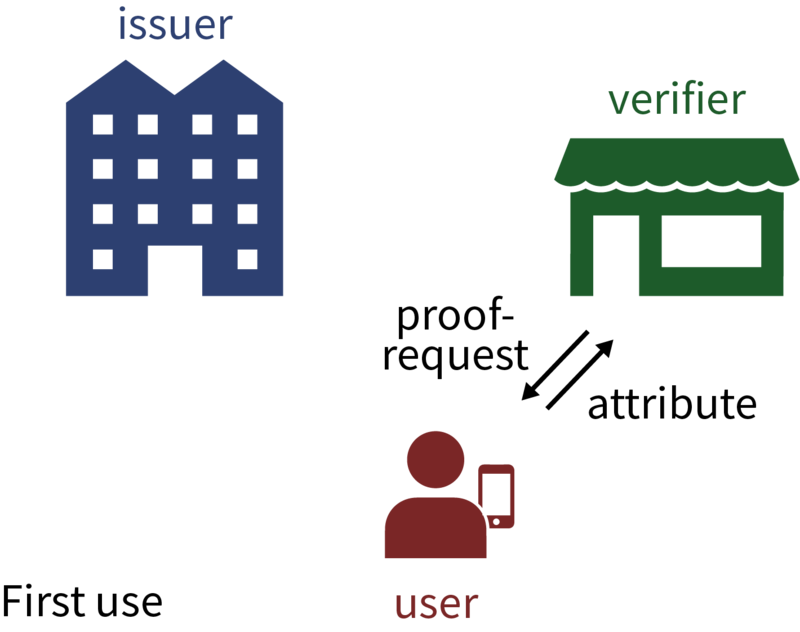 By the blindness of the signature, issuers do not see the ultimate form of the signed credential, and hence can not trace its usage, even if the issuer colludes with verifiers. This property is called issuer unlinkability. The Privacy by Design foundation has freely available open source software for issuing credentials. whether the attributes are still valid (not expired)? is the digital signature valid, so that the origin (authenticity) and integrity of the credential is guaranteed? do the attributes come from an issuer that the verifier trusts sufficiently? For instance, a verifier may trust a name attribute if it has been issued by national authorities, but not when it has been issued by Google, say. when attributes are disclosed from different credentials: do they belong to the same person? The Privacy by Design foundation has freely available open source software also for this verifier role. It allows a webshop, or other organisation, to verify attributes from its customers, see the more detailed explanations elsewhere. Small webshops may wish to outsource such attribute verifications to third parties, just like they often outsource payment processing. This is possible, but is not ideal for privacy, since these external verifiers see many attributes. Such a third party may offer IRMA attribute verification as a commercial service. Credentials are cryptographically bound to a mobile phone, and to each other, via a personal secret cryptographic key. This private key is crucial for the security of the IRMA app; it must be stored securily. Such secure local storage is difficult on a mobile phone, since the device may be rooted or hacked. That is why a small but crucial part of this private key is stored outside the phone on a so-called keyshare-server that is operated by the Privacy by Design foundation. The IRMA PIN code is checked by the keyshare server, see the more detailed explanations elsewhere. Only when the PIN checks out, will the server participate with its own small part of the secret personal key, and can attributes be disclosed. The keyshare sever will not see the attributes themselves, nor to whom they are disclosed. This entire secret personal cryptographic key, and thus the cooperation of the keyshare server, is necessary for each IRMA operation, such as receiving and disclosing of attributes. As long as my key stays under my control, my attributes cannot be used by others. Thus, my attributes cannot be transferred to other user IRMA users — unless I somehow also transfer my secret key. 7. Which privacy guarantees does IRMA provide, and which not? The following terminology is used for IRMA’s privacy guarantees. Issuer unlinkability. 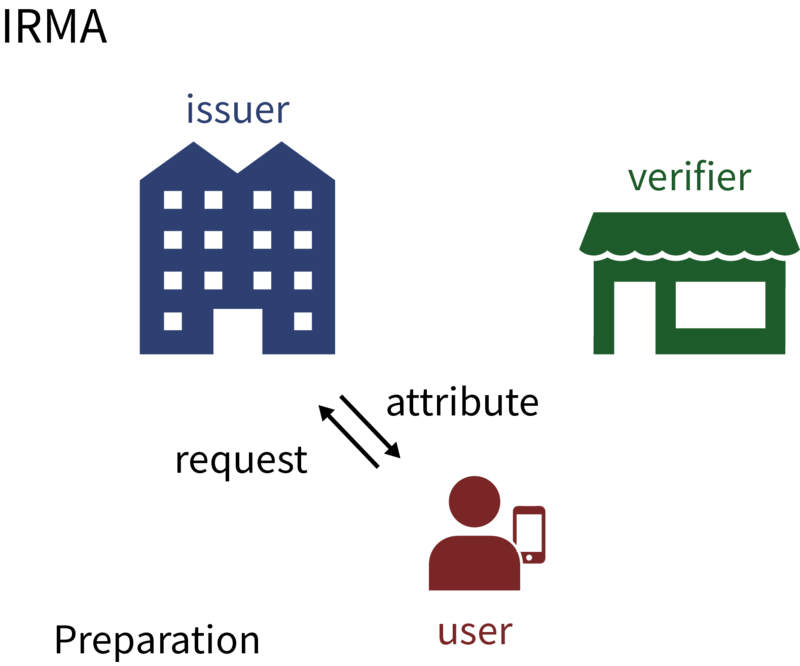 This means that an issuer of attributes can not trace the disclosures of these attributes by a user, even not when the issuer colludes with a verifier and both parties put there data together. Of course, this does not work for identifying attributes, like your bank account number, but it does work for non-identifying attributes, like your gender. Multi-show unlinkability. 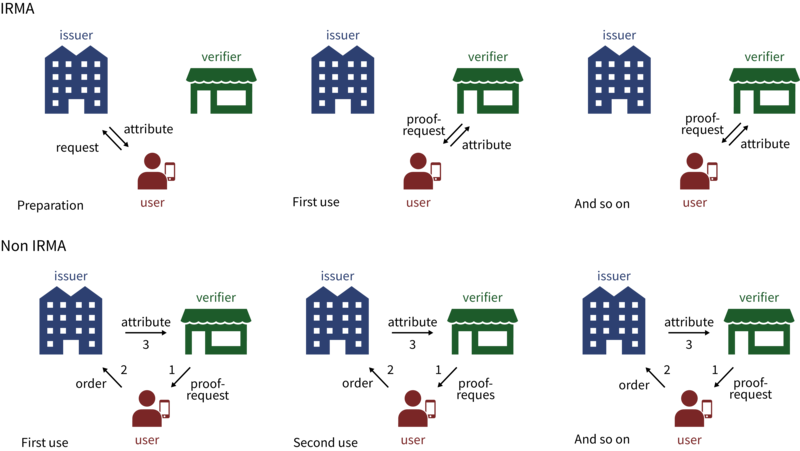 This means that multiple disclosures of the same attribute by the same user cannot be linked by a verifier. Concretely, if, on a single day, you prove to a webshop that you are older than 18, then the webshop cannot find out that the same person is behind both disclosures. These properties are built into the underlying cryptographic system (Idemix) on which IRMA is based. Nevertheless, it is still possible that privacy-sensitive information leaks out, for instance the IP-address involved, or the “fingerprint” of the browser. The above webshop may conclude, rightly or not, that the same person is involved because both attribute disclosures come from the same IP-address. Protection against this is possible, for instance via anonymisation technologies, such as Tor. But such protection is not built into IRMA. 8. Which values does the IRMA technology embody? Authentication requirements, and information flows, reflect the power relations in society. In general, the more powerful parties impose authentication requirements and mechanisms on the less powerful parties. The Privacy by Design foundation is well aware of these societally important issues and aims to use value-laden design in offering IRMA as a transparant open identity platform for proportional and contextual authentication that empowers, instead of weakens, users. This context-dependence is related to Helen Nissenbaum’s interpretation of privacy as contextuele integrity. IRMA works via freely available open source software. Everyone can inspect and judge how it works. This contributes to confidence, not only in the proper functioning of the IRMA system, but also in order to check that there are no hidden backdoors in the system. Such transparancy is essential for broad voluntary usage and acceptance of sensitive ICT-infrastructure, like for authentication. With IRMA there is no commerical lock-in, and there is no extorted trust. Even if the foundation somehow goes down, the IRMA software will still be there and can be maintained and continued by others. Thus, IRMA is not about plundering or deceiving users, or about surreptitiously steering them commercially or politically, but about encountering them transparantly, with dignity, respecting their autonomy and privacy. IRMA is based on properties of individuals (attributes) whose source is explicitly visible, namely in the form of the issuer who commits itself via digitial signatures to the validity of these attributes. IRMA is thus about “objective” properties and qualifications of people, where the objectivity lies in the verifiable origin of attributes. In this way IRMA distinguishes itself from “subjective” reputation-based systems, in which qualifications can be manipulated relatively easilty and their origin is seldomly transparent. IRMA does not exclude commercial activities surrounding authentication. But these commercial activities work best on top of an open basic infrastructure, and not in its core. Internet protocols like TCP and IP are also open, and form the basis for the succes of the internet, together with all the commercial transactions that run on top of TCP/IP. 9. What are attribute-based signatures? IRMA is primarily a system for attribute-based authentication: with IRMA you can selectively disclose attributes about yourself. But IRMA offers more, namely attribute-based digital signatures. This is still in an experimental phase. With a traditional “wet” signature a signer agrees to the content of a signed document. Such a traditional signature typically includes the name of the signer, the date/time of signing, and the signer’s handwritten “scribble”. A digital signature is an addition that is attached to a digital document that can be generated exclusively with the personal (cryptographic) key of the signer. This personal private key is strongly bound to an individual via a certificate that contains the associated public key. Digital signatures that satisfy certain requirements have a legal status. A big disadvantage of both tranditional and current digital signatures is that they give very little information about who precisely signs, in which capacity. An attribute-based signature is a special digital signature in wich the attachment to the document securely contains a number of attributes of the signer. These attributes are visible to everyone who checks the signature. In this way you can see for instance that a written account of ilness has actually been signed by a medical doctor, via the “medical doctor” attribute, possibly combined with the signer’s medical specialisation. Another example is a request from a citizen to the authorities, say about some permit, which is signed with the citizen’s own national registration number included as attribute. In this way the authorities recognise that the request really comes from a particular citizen. Also payment orders can be realised via attribute-based signatures, by including the bank account number of the signer as attribute in the signature. Attribute-based signatures are supported by the IRMA software. Attribute-based signatures form a novel concept with unprecented application possiblities. 10. What are IRMA’s disadvantages? The most important advantage of IRMA is: the user maintains and fully controls his/her own attributes. But this is at the same time a disadvantage: an IRMA user will have to do this actively. This requires some effort, and also some level of understanding how IRMA works and what has to be done. Your identity is a very valuable asset, which you have to handle with care in the digital world. This is something we still have to learn collectively. With IRMA it becomes transparent which of your attributes are requested where. You first have to load those attributes into the IRMA app on your mobile phone. And when these attributes expire, you will have to renew them. And when you replace your phone itself, you will have to reload all your attributes into (the IRMA app on) your new device. All of this is a “hassle”, which is part of careful dealing with your digital identity. IRMA puts you in control and helps you to handle your digital identity with the same care that you have for your passport. These are (possible) disadvantages for users. A “system” disadvantage is that the traditional intermediary way of making money does not work with IRMA: users cannot be profiled by attribute issuers, and there are no third parties that have to be payed for each authentication session, see above. For IRMA users this may actually be an advantage. However, the identity platform IRMA is economically viable. 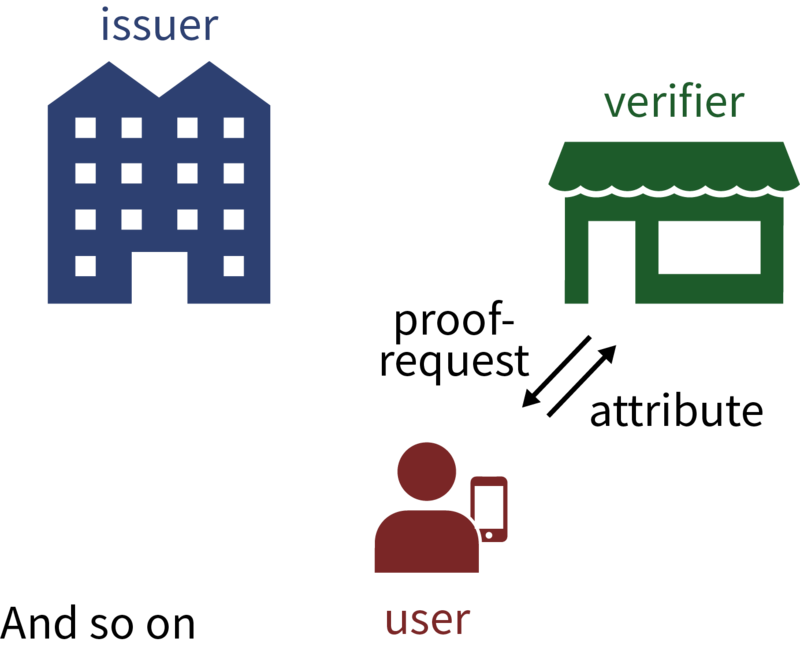 Issuance and verification of attributes may form a commercial service, which can be performed by third parties. Also, the Privacy by Design foundation may issue certain specialised credentials for a fee. Possibly, in order to maintain its activities in the long-term future, the foundation may start charging IRMA users, for instance a couple of Euros per year, for a basic set of attributes. 11. How can I participate or contribute? IRMA is an identity platform that is being built up from below, and is not imposed from above. IRMA will have to prove itself, via convincing applications. Several parties are currently working on this. possibly extend this software for optimal use within your application; such extensions will in principle also be open source and be available for others. The foundation may aks a to-be-determined financial contribution for such advice, in order to maintain its own activities. The foundation is a not-for-profit organisation, without commercial targets. Even if you do not have a concrete application in mind, but wish to contribute to the IRMA development, via your efforts or via a financial contribution, do get in touch.